If you use Google calendar and Outlook calendar at different locations like one at work and one at home, it is cumbersome to update both of them to have the same information on both of these tools. Google introduced a small utility for syncing Google Calendar with Outlook Calendar that makes your life easier. 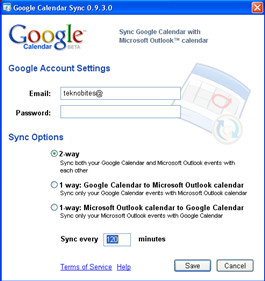 Google Calendar Sync is a 2-way syncing application between Google calendar and Outlook calendar. You can change the 2-way to 1-way sync either from Google calendar to Outlook calendar or from Outlook Calender to Google Calendar. The default sync time is once in 2 hours, but you can change that too. Google Calendar sync utility will sit in the system tray after installing, you can access it with right click to change the options, it syncs automatically at specified time interval.